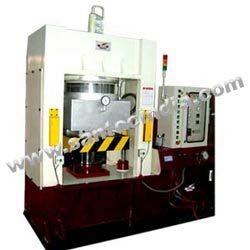 These presses eliminate any chance of air entrapments in the mould during curing process. This ensures quality, precision and accuracy in final product and minimizes rejection chances. The parallelism accuracy is also very important in these presses, as they are helpful in producing better quality key pads. Machines are available with PLC & MMT touch key panel, sliding or pusher cylinder & tilting arrangement. These presses are highly suitable to produce oil seals especially for automobile / motorcycles etc. They feature PLC control and top plate tilting arrangement with bottom ejection. In these presses, the curing time is further reduced. These presses are available in 50, 80, 100, 125, 150, & 200 tons capacities. These presses are available in 4-pillars type & fabricated type designs. Having bottom platen sliding and ejector arrangement, they are highly suitable to produce metal bonded rubber parts, bellows, engine mountings.